What Distro for Acer Aspire 32gb eMMC? Discussion in 'Getting Started' started by The IanCurtis, Nov 14, 2018. I'm a complete beginner here. I have an Acer Aspire One 1-431 2gb Ram Intel Celeron N3050 1.60Ghz with a 32gb eMMC flash drive. Is has Windows 10 as the OS which isn't working properly the issue is there isn't enough space on the drive to update Windows and I've deleted everything else off it. Is there a Linux Distro suitable for me? I don't mind getting rid of Windows altogether. All it's used for is browsing and a few small documents. Does this sound like your specs? Yes that looks like it alright. I think that one problem might be that stuff like RAM is soldered in and can't be upgraded. The software will have to tend towards being lightweight. The IanCurtis and wizardfromoz like this. I've tried Linux lite and Lubuntu. Both boot up fine the only issue is the mouse pointer isn't working on either. Is there something simple I'm missing or need to do? I would try other distros but there's no point if I'm missing something. G'day Ian, is that on a Live USB situation or installed? That lappie of yours will have a trackpad style device. Does it work OK and do you use it or prefer (as I do) the mouse? An early guess at this point in time is that the trackpad could be interfering with the use of the mouse. I'll just swing over to LL for a minute and check something and then be back. Back - Linux Lite has xinput. 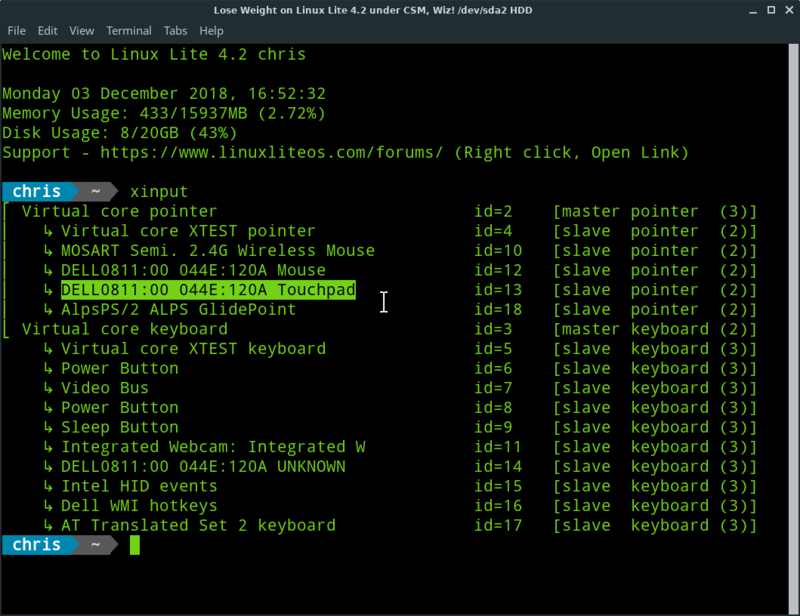 xinput is a Linux command that shows us our peripheral devices and we can enable/disable devices using it. Here's a screenshot of mine used from LL, and I've highlighted (on my Dell Inspiron) the touchpad entry. If I were having problems with my touchpad, I can use xinput to temporarily disable it and check to see if that works, and if so, we can permanently disable it. Many of the Distros also have the facility to disable one while the other is in use. If you are in a Live scenario with either or both of Lubuntu and LL, you could likely do same to test. Let us know what you think and we will go further. Yes it's a live Usb. It was the touchpad which I couldn't get working but I tried a mouse I had and it works fine. The touchpad pointer isn't coming up in xinput at all. It's not that important if the mouse works anyway. Any further problems, sing out, there are a couple of files we can take a look at that may contain reference to the touchpad, and we can modify them if you are happy to. OK I've a new issue. I tried Lubuntu on a live USB. Everything worked fine and was happy with it. So I installed it. Install seemed to go OK when finished it said good to restart or continue using live USB. I chose to restart. When I restarted the laptop I'm just getting a black screen with only thing visible is the mouse cursor. I tried to go back to live USB but still just getting black screen. I tried to go back to live USB but still just getting black screen. Does that mean you powered down the machine again and rebooted, or other? Unfortunately, Linux does have the occasional Black Screen of Death issue, usually with a graphics card. Most common workaround for this, to get you going, is to try an environmental option called NOMODESET at startup. We need to get what is called a Grub Menu to appear, and that is invisible when you just run one Linux. If you dual boot with Windows, or have two or more Linux, it is there. https://ubuntuforums.org/showthread.php?t=2365805 ... it's as recent as last year, it's about Lubuntu, and the rig is an Acer Aspire - might check all the boxes. Computer manufacturers often don't do us Linuxians (coined a new word, there, I think) any favours, by having different hot keys for different processes. To get the Grub Menu to appear, you need to boot the computer and immediately start holding down, or tapping, the Shift key. Some use Left Shift, some Right. if Shift does not work, try Esc or Space bar. When the Grub Menu appears, it will have a header at top, then two or three lines, and likely 3 to 4 options at Bottom of screen. The one you want is "e" to edit startup commands. Once in there, navigation is with your arrow keys. Put in the line that features "quiet splash" the extra option "nomodeset". Follow the instructions to reboot. If that takes you to the login screen, enter your password and proceed to the desktop. Once we get to the Desktop, we write those changes permanently and also make your Grub Menu visible at startup, it is useful. See how you go with that and I'll check back. OK read through most of that and think I'm doing things right I can get into the grub menu. It's tap esc at boot. quiet splash is in first 2. Where exactly should I include nomodeset? I've tried in both options but to no success still getting black screen. It's tap esc at boot. See what I mean, about "they" don't do us many favours? Escape, cool. When Lubuntu 18.10 GNU/Linux is highlighted, at top, there should be at bottom of screen, those options I referred to. Could be C for command, E for edit, and an Escape to return to previous screen. Not sure what you mean by that, did you get as far as seeing "quiet splash"? So you would choose E for Edit, arrow down to the line including "quiet splash" and simply add "nomodeset" but within the quotes. So it will look like "quiet splash nomodeset". After that it is F10 I think to boot into the Distro. See how that goes. "Not sure what you mean by that, did you get as far as seeing "quiet splash"?" but either line with quiet splash doesn't have it within quotes "
I will look later and at the exact line. "So you would choose E for Edit, arrow down to the line including "quiet splash" and simply add "nomodeset" but within the quotes. So it will look like "quiet splash nomodeset". After that it is F10 I think to boot into the Distro. See how that goes." Yes it's F10 to boot. I will try above anyway and let you know how it goes. I got the mouse touchpad working. There is a main page in the bios and I changed touchpad set up from advanced to basic. My bad, quotes not needed, they are used in a file called /etc/default/grub you will become acquainted with over time. Lubuntu working fine. I did a fresh install and added nomodeset to line with quiet splash and all good now. Just using for browsing and some basic documents. It's great how little disc space it takes up. Windows really is a greedy OS in comparison. Thanks for the help really appreciate it. and added nomodeset to line with quiet splash and all good now. OK, that's good. Now if that was at the startup, then the changes only hold for the current session, you would need to repeat with each reboot. What was prior to this was to see if that resolved or worked around the issue. To make the changes permanent, we need to write that into a file with no extension, called (surprise) grub. It is /etc/default/grub and you will need your password to edit it. You can do this, in session, either with a GUI-based method, or else at Terminal with command line methods. Command line is probably better, because following editing grub, you will need to update it and that requires Terminal, before rebooting. If you have already worked out how to do this I need go no further, or else sing out and I or someone will help. Enjoy your Linux, you are at the starting point of having a ball.